I feel like I’m on a speeding train hurtling towards Origin without any stops. The last week has whizzed by with barely time to notice the scenery. I did maked a couple of scheduled stops in London last week including a very successful meeting with a publisher, which I hope to share with you very soon, and a trip yesterday to 100% Design and Decorex, both interior design trade shows. I would love to burble on about all the great stuff I saw, but, alas Origin prep is rather too pressing, with only a week to go. Another time, I promise! 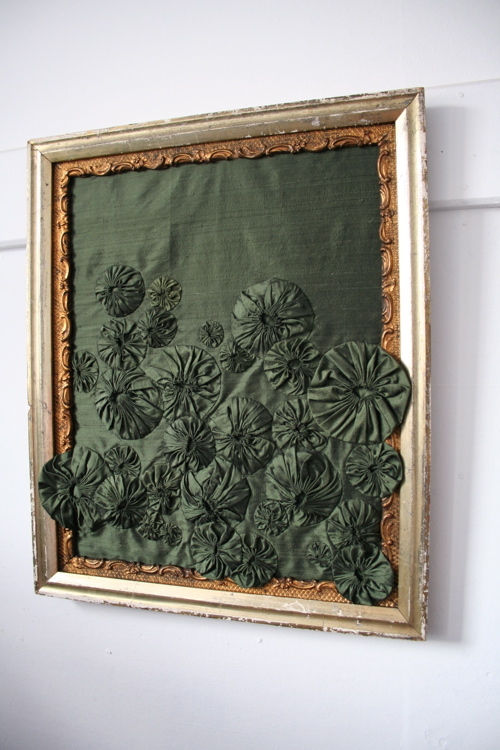 Framed at last – silk Betty panel, ready for Origin. I like this even more now it’s framed. 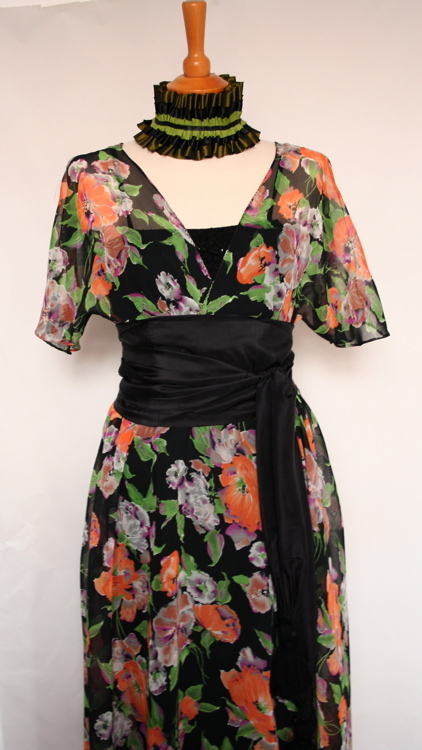 I made this dress ages ago, but only just photographed it, ready for website update. The pattern is of my own design. The fabric is synthetic chiffon I bought for a few pounds years and years ago and is very like 1930s prints, which is why I bought it. The ruff is one of mine from stock, the sash is silk with matching tassels and the underlayer of the dress is a charity shop skirt and camisole which is customised with some antique black beaded lace. Or at least it was beaded until I put it through the washing machine by accident. Twice. oops. Beautiful stuff Ruth. I love the framed silk yo-yo’s – it enters another realm!